Just as there is no magic pill to prevent cognitive decline, no single almighty brain food can ensure a sharp brain as you age. Nutritionists emphasize that the most important strategy is to follow a healthy dietary pattern that includes a lot of fruits, vegetables, legumes, and whole grains. Try to get protein from plant sources and fish and chose healthy fats, such as olive oil or canola, rather than saturated fats. That said, certain foods in this overall scheme are particularly rich in healthful components like omega-3 fatty acids, B vitamins, and antioxidants, which are known to support brain health and often referred to as foods. 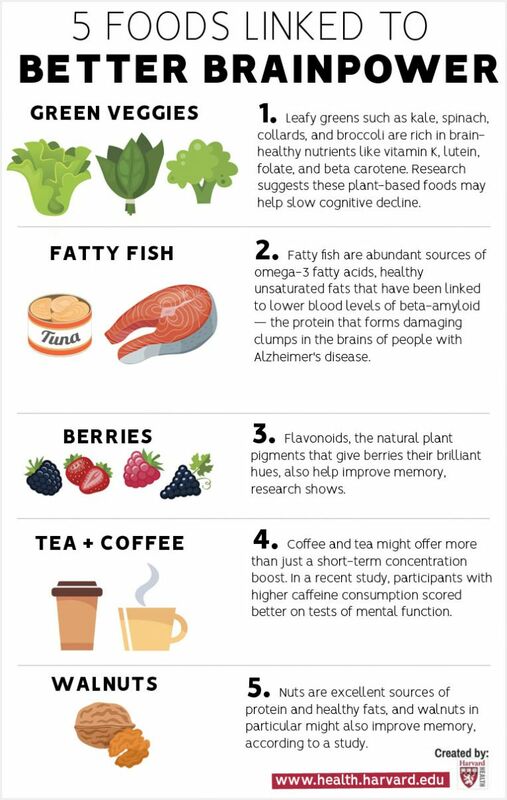 Incorporating many of these foods into a healthy diet on a regular basis can improve the health of your brain, which could translate into better mental function. Fatty fish. Fatty fish are abundant sources of omega-3 fatty acids, healthy unsaturated fats that have been linked to lower blood levels of beta-amyloid—the protein that forms damaging clumps in the brains of people with Alzheimer's disease. Try to eat fish at least twice a week, but choose varieties that are low in mercury, such as salmon, cod, canned light tuna, and pollack. If you're not a fan of fish, ask your doctor about taking an omega-3 supplement, or choose terrestrial omega-3 sources such as flaxseeds, avocados, and walnuts. Berries. Flavonoids, the natural plant pigments that give berries their brilliant hues, also help improve memory, research shows. In a 2012 study published in Annals of Neurology, researchers at Harvard's Brigham and Women's Hospital found that women who consumed two or more servings of strawberries and blueberries each week delayed memory decline by up to two-and-a-half years. Tea and coffee. 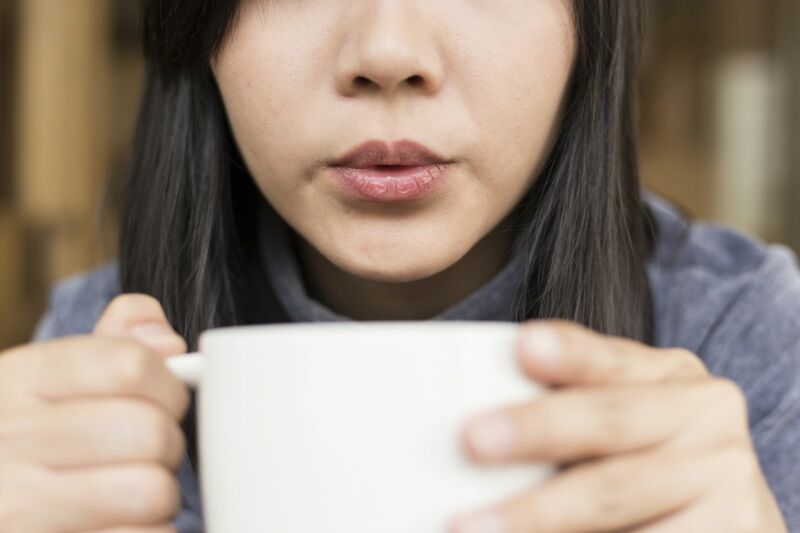 The caffeine in your morning cup of coffee or tea might offer more than just a short-term concentration boost. In a 2014 study published in The Journal of Nutrition, participants with higher caffeine consumption scored better on tests of mental function. Caffeine might also help solidify new memories, according to other research. Investigators at Johns Hopkins University asked participants to study a series of images and then take either a placebo or a 200-milligram caffeine tablet. More members of the caffeine group were able to correctly identify the images on the following day. Walnuts. Nuts are excellent sources of protein and healthy fats, and one type of nut in particular might also improve memory. A 2015 study from UCLA linked higher walnut consumption to improved cognitive test scores. Walnuts are high in a type of omega-3 fatty acid called alpha-linolenic acid (ALA), which helps lower blood pressure and protects arteries. That's good for both the heart and brain. For more on staying sharp as you age, read Cognitive Fitness, a Special Health Report from Harvard Medical School.